يوفر فندق Coromandel TOP 10 Holiday Park & Motels ظروف إقامة راقية وهو خيار رائج للسياح ولرجال الأعمال أيضاً. يقع في منطقة سياحة من المدينة. يسهل الوصول إلى هذا الفندق ذو 4 نجوم من المطار، فهو يبعد عنه مسافة 230.0 km فقط. كما يمكن الوصول بسهولة إلى عدة معالم سياحية قريبة. استمتع بالخدمات الراقية والضيافة التي لا مثيل لها بهذا الفندق في هذه المدينة رائعة الجمال. لضمان راحة ضيوفه، يقدم الفندق الخدمات التالية: تخزين الأمتعة, واي فاي في المناطق العامة, صف السيارات, خدمة الغرف, غرفة عائلية . يمكن للنزلاء الاختيار من ضمن مجموعة من الغرف المصممة بعناية لتعكس جواً من الراحة، والتي يتجاوز عددها 23. كما أن مجموعة الخدمات الواسعة الموجودة في الفندق لضمان راحتك تترك لك الكثير من الخيارات لقضاء وقتك أثناء فترة إقامتك. إن Coromandel TOP 10 Holiday Park & Motels هو خيار ذكي بالنسبة للمسافرين، فهو يوفر إقامة هادئة ومناسبة للاسترخاء. Thank you for your great review Chris, here at the Coromandel TOP 10 we aim to provide a clean, friendly and well equipped environment for our guests and we are glad this was no different for you. It would be a pleasure to host you again! This trip was very big adventure for us because i have 2 young kids. as well as it was too far as long distance from Auckland city. however we were really satisfied and all had a really great time at there. thanks. Thank you for your review Ashley. Here at the Coromandel TOP 10 we are definitely a family park so happy your family enjoyed your time here. We do hope to see you again soon. The only con is the park isn’t smoke free. It’s a shame as both the cabins next to us had people smoking right next to our door. Considering it was a family cabin It should have been smoke free. Thank you Lisa for taking the time to review our Park, our staff aim to provide a clean and well equipped environment for our guests and we are glad this was no different for you. We do have areas in the Park which are smoke free, it is hard to manage this if we are unaware it is happening. We do hope to see you again soon. The luxury villa sleeps 11 very comfortably. Great outside space for dining and kids. Still able to use the parks other facilities. Thank you for your great review Vivienne, we are so glad you enjoyed your stay with us. Our four bedroom luxury villa is the perfect place to base a family holiday, with plenty of room for everyone, plus your own private outdoor entertaining area. The kids loved the carts, heated pool and the ice creams were definitely a hit with them too! It was a pleasure hosting your group and we hope you will come and stay again! Great Staff. Superb Service. Great Location. Nice facility. Overall - AMAZING! Awesome Angelo, thank you for your great feedback. We are so glad you enjoyed your stay with us! Here at the Coromandel TOP 10 we aim to provide a clean, friendly and well equipped environment for our guests and we are glad you noticed this. It was a pleasure hosting you, hopefully one day we will see you again! Great location. Staff very friendly and helpful. Our cabin was really well equipped. The shares kitchen had everything you would need !! Very clean facilities. Would highly recommend. Thank you for taking the time to leave us feedback Carolyn. Our staff aim to provide a clean, friendly and well equipped environment for our guests and we are glad this was no different for you. We are glad you enjoyed your stay and wish you all the best for the new year. The place is fairly cheap and the installations are brilliant. Nice showers, clean bathrooms, plenty of entertainment. Rooms are really clean and tidy and the staff attention is great! Thank you for taking the time to write a review Nicolas, we aim to provide a clean and friendly environment for our guests and we are happy this hasn't gone unnoticed. We have a range of accommodation here at the Coromandel TOP 10, from standard bunk rooms to luxury villas, something to suit everyone's budget. We are glad you enjoyed your stay with us Nicolas and hope you will come and stay again. many ants inside room, blankets are dirty, room too small for three ppl. no oil, salt or sauces in kitchen. Communal cooking & shared facilities meant we talked with our neighbours a lot. This made for a pleasant stay & sharing of information. This is a good central place for looking around Coromandel. We got a free feed of freshly caught snapper from our neighbours! Standard cabin with bunk beds, equipped kitchen, bathroom, laundry a few steps away. Pool, jumping pillow, playground, TV lounge, and go karts keep kids busy with lots of friends. Decent stay. 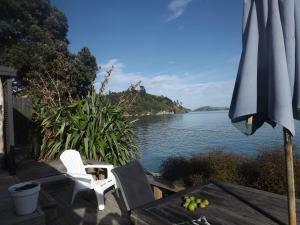 Nothing exceptional but decent enough for overnight stay when passing through the Coromandel. Good location near to cafes/restaurants/shops and friendly staff. We didn't have time to use on site facilities such as BBQs etc so wouldn't be able to comment on such things. It was pleasant though some people arrived at 3.00 am and made much noise. Apparently they booked on line Owners were fabulous. you get swimming pool, activities for children and the rooms are great. the staff is very friendly.